The Collaborative Economy is a crowd commerce revolution. People are empowered to get what they need from each other, using now common, mobile technologies in their pockets. Several quarters ago, people told me it was a fad; it wouldn’t last; peer-to-peer commerce can’t happen at scale. Like social media was disbelieved in 2005 (I vividly remember the attack of the blogs), we’re seeing disruptions, but these impact real revenues, not just communications. 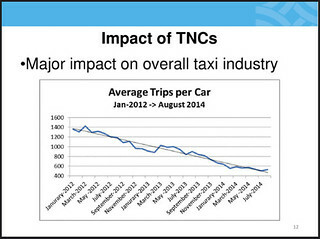 Above Graphic: A TNC (Transportation Network Company) is the designation for Sidecar, Uber, and Lyft. From SF Municipal Transportation Agency, SF Examiner.Real revenues are being lost by incumbents. 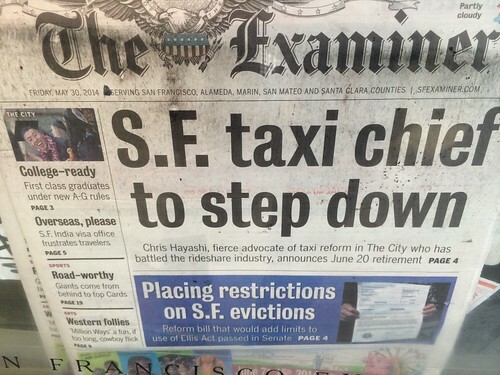 Yesterday, at newsstands across the San Francisco Bay area and online (my pic, above), it was reported that taxis are suffering a 65% loss in rides – two thirds of their revenue lost in less than 3 years. 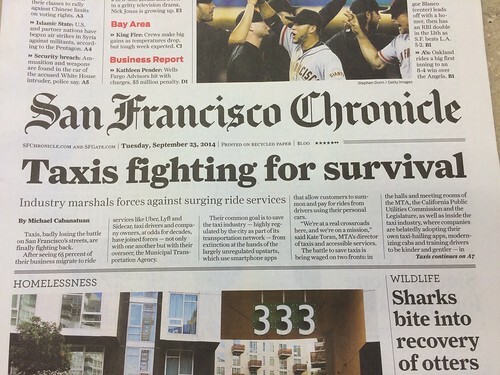 It’s not limited to San Francisco. DC taxis are down 22% and a once dominant taxi cab company says they have less than 18 months of life left. A recent study by Boston University shows that, for every 1% growth of Airbnb, hotels are impacted half a percent – and Airbnb is growing at an incredible rate. How fast? Uber’s revenues are doubling every six months, and Lending Club, where people lend to each other instead of going to banks, is having hockey-stick like growth, having brokered $5 billion worth of loans in five years. The startups are heavily funded in every industry. Investors are funneling incredible amounts of money into this market: $2.7 billion in just under the last ten months (see spreadsheet), with Google being a leading investor in the market. It’s not limited to cars and homes and dollars. The Collaborative Economy is impacting many industries, including food, business services, retail, business space, and more. You can see the Honeycomb Framework to see how goods, food, services, transportation, space, and money are each impacted. The next version of the honeycomb infographic will include health, utilities, education, and more. Progressive corporations augment their business model to partner with the crowd. If you work for or with large companies, access the Body of Work in the Collaborative Economy and discover how other companies are crowd-proofing by joining this movement.